Ahhh, Fall. Pumpkins, corn mazes, scarecrows - what's not to love? I am SO going to a corn maze this year, by the way. Even if I have to go alone. Though it would make for a fun group trip outing, if anyone is interested? They have one up in Canton that I hear is good, and how cute, they have hayrides and a bonfire too that you can check out. So I especially love Fall for the food and drinks that are now ok to have again after the long hot summer. Like caramel apple cider, pumpkin bread, and stews. One of my favorite memories are the crisp Fall mornings when I was at Georgia Tech and I'd stop in before my marketing classes for my fav Grande Nonfat Chai at the Starbucks on campus. LOVE. It just yells Fall to me, all spicy and warm. Of course now, since I am "On a Budget," I have noticed that the Tazo chai box of mixer that makes 4-5 drinks is equal in price at Kroger to one single chai at Starbucks. This gal will be doing her Starbucks at home for now, I think. But that's off topic. In any case, since its Fall, a few new things are going to be on my menu to replace the BBQ, summer salads, and ice cream. I think this recipe may be first on the list. I ran across it last year (she posted it a year ago today!) and bookmarked it for just an occasion. 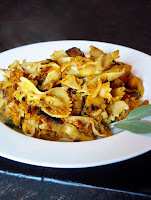 Pasta with Roasted Butternut Squash, Sage, and Pine Nuts sounds perfect for a pretty easy weeknight meal, and it only has like 5 ingredients in it that you might need to pick up at the store that you don't have at home. The most complicated step is prepping the squash and roasting it for 40 minutes. That sounds like a perfect time to have some cocktails in the meantime to me! Hey Girlies! Me and Ari made this for dinner the other night. And I told Kat I had a few suggestions. I went ahead and added some sweet italian sausage and it went perfectly with the dish. In the last 30 seconds or minute I would add some liquid to the pan - I used chicken stock but Kat said she saw wine was suggested. Def reccommended. The end result is ALOT of food. We split it into two batches like the recipe suggested, but even then the pan took a while to crisp things up. And another thing that might just be personal taste - I would add a little more salt to the butternut squash while it roasts and I would use a whole packet of the sage next time, I think I only used about 3/4 - but mmm fried sage is delicious.